Been busy, I will get these posts done though! I’ll start off by saying I got shutout at this game, even though I was at the stadium alot of ballhawks call the best place in the MLB. 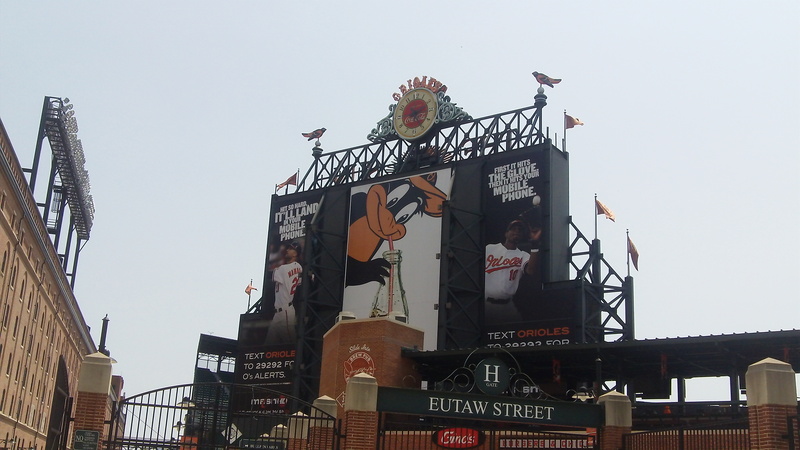 I went down to Baltimore will Ballhawk Rick and his friend Hunter who is a character. Honestly, I don’t really have alot to talk about in this post, so I will just show everyone some pictures. I think that is one of the coolest pictures I’ve ever taken! 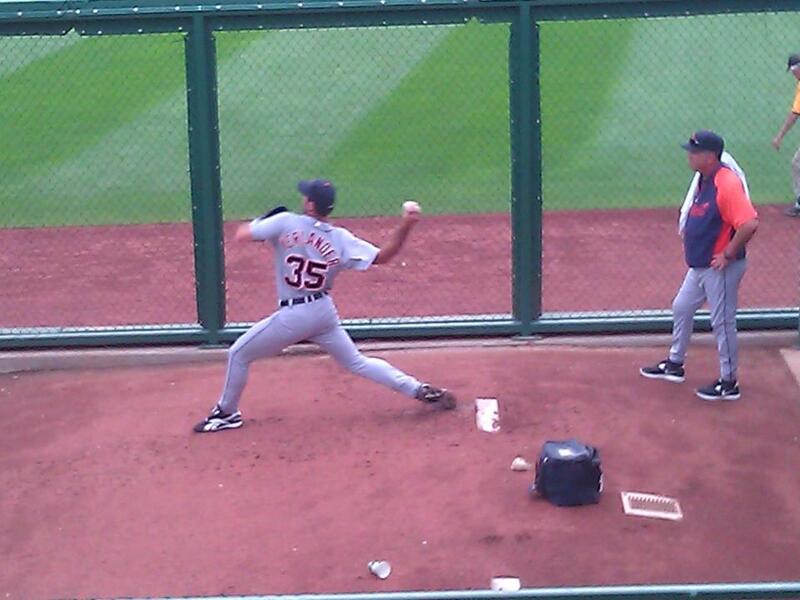 Thanks Camden Yards for the awesome bullpens! 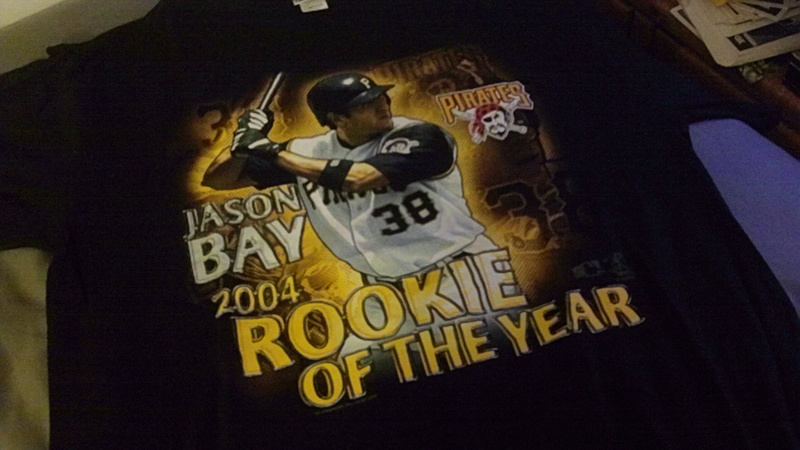 I like this t-shirt, I saw a lot of O’s fans at the game wearing shirts they’ve gotten on giveaway nights, looks like they have great promotions, while the Pirates have terrible ones. I really didn’t want to go to this game because it was a Sunday game, which are usually a ballhawks worst nightmare. I went to this game for three reasons. 1) My friend Matt talked me into it. 3) I got a free ticket for this game from Ballhawk Rick (who sat on the riverwalk outside the stadium waiting for a homer from Prince Fielder). I got one ball at this game, and it was after the game from the coolest coach in the MLB, our bullpen catcher, Herberto Andrade. As for the game, Justin Verlander pitched a complete game, he pitched great in two starts against the Pirates this year, two complete games, one of which was a one hitter back in May. 1 ball at this game. 37 balls at 13 games this season. Well, I was going to make this a long entry about these two games, but I took most of the pictures on my phone and it is not letting me upload on my pictures on to my computer for some reason. Well I got to PNC around 3:15, Ballhawk Rick was already in line, and told me that members from the band Korn walked past us, I did not notice. He gave me one of his baseballs that he had in his backpack so I could get his signature. Very cool! 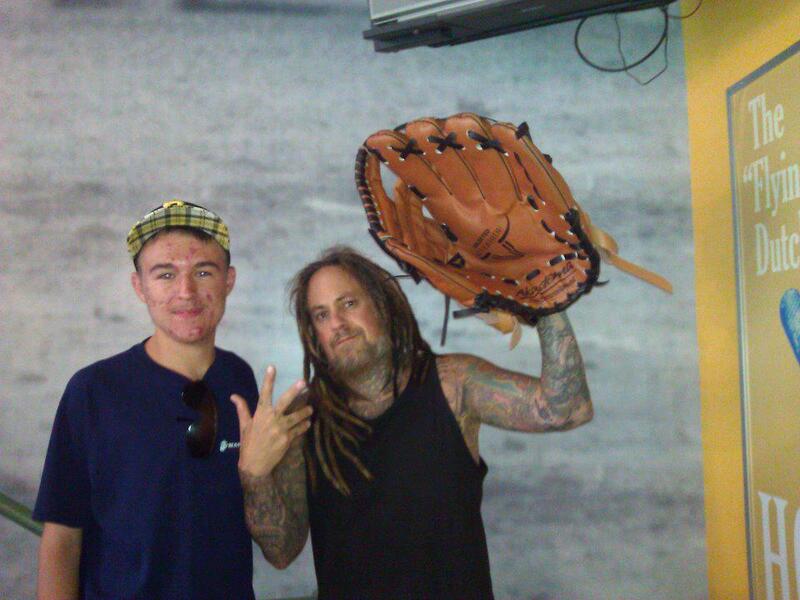 Korn has been one of my favorite bands for years. Ballhawk Rick and I both got his autograph on a baseball. I got two balls at this game. Ball #1 – was a toss-up by the bullpen from pitcher, Juan Cruz. 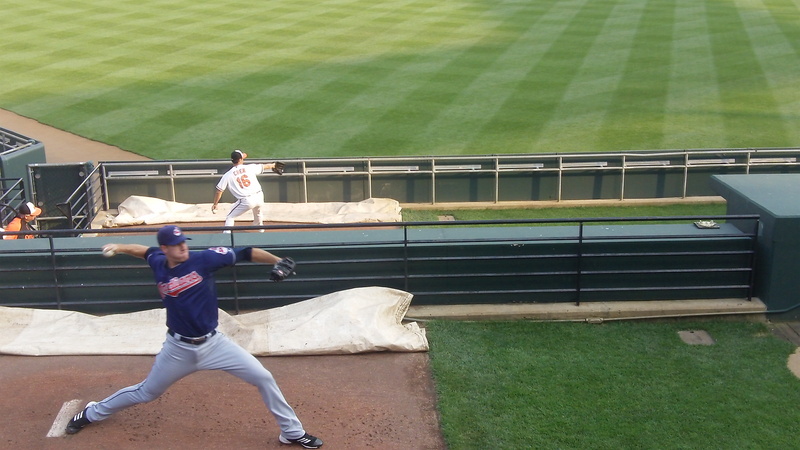 Ball #2 – was a toss-up in section 140 from Twins pitcher, Alex Burnett. I was close to Andrew McCutchen’s home run at this game, that’s twice this year I have been close to a home run from an All-Star. I arrived at PNC Park earlier than usual. Early enough to get autographs from Twins players as they arrived at the ballpark. I had an extra baseball from the day before, so I had 5 Twins players sign it. Matt Capps, Liam Hendriks, Alex Burnett, Denard Span, and Glen Perkins signed that ball. I snagged 4 balls at this game. 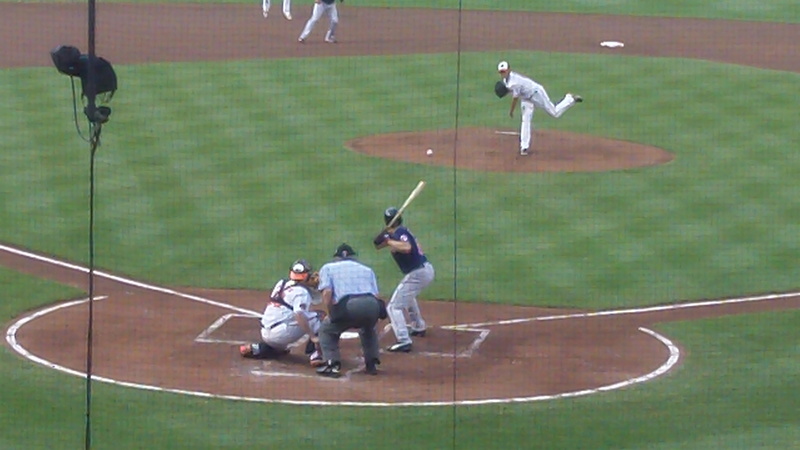 Ball #2 – was a toss-up from Josh Willingham. 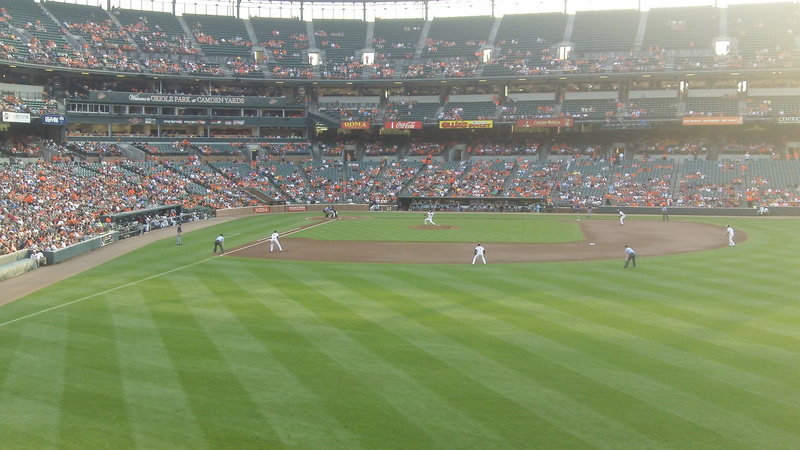 Ball #3 – was a found in Section 140, the ball was lodged underneath a cup holder. 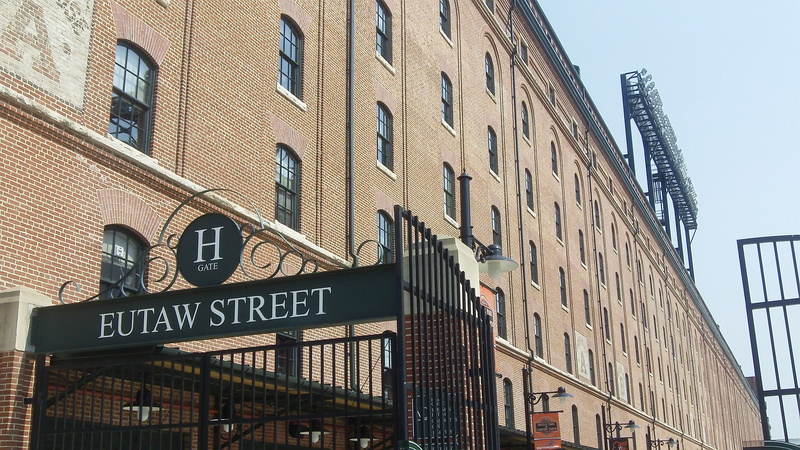 Ball #4 – was a toss-up from Andrew McCutchen in the 5th inning, the ball was not intended for me, it bounced off a persons hand, and a rail, then landed in my glove. I took a quick look at the ball, and handed to a woman that was seated in Section 141. 36 balls at 12 games this season. 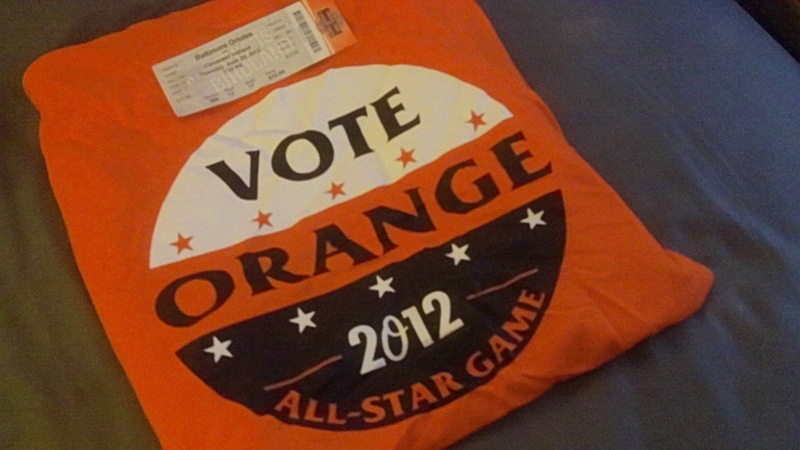 Also, look at the shirt I got after Tuesday’s game! Yes! I will be wearing this shirt to games! This will be quick, one thing I can say about this game is missed opportunities. Ball #1 – was a toss-up from Herberto Andrade, I’ve said this before he is the coolest coach in the league. Ball #2 – was hit by catcher Michael “The Fort” McKenry, the ball took a crazy bounce and I ran full speed to snag it. Ball #3 – was a toss-up from a Reds pitcher, I believe it was Pittsburgh area native JJ Hoover, but I am not 100% sure. 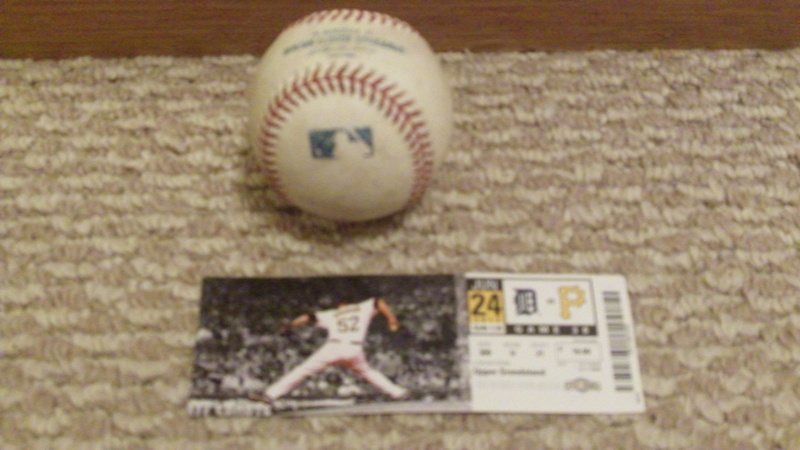 Ball #4 – was Andrew McCutchen’s warm-up ball in the 5th inning. This game didn’t start until 9, because a crazy thunderstorm came through Pittsburgh, we luckily had BP though. After snagging Cutch’s warm-up ball, I left. 4 balls at this game. 30 balls at 10 games this season. I have been lazy and busy lately, so I will make this blog post quick. Ball #1 – was a toss-up from my favorite Pirate pitcher, Jason Grilli, he tossed the ball my way, it started to fall a little short, I reached over the wall and snagged it. 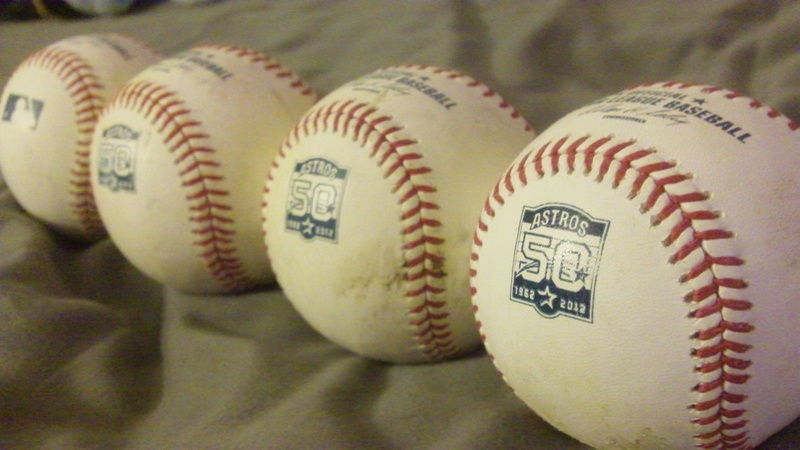 Ball #2 – was a toss-up from Reed Johnson, this ball was an Astros commemorative. Ball #3 – at 5:30 when the rest of the stadium opened, myself and other ballhawks raced to the center field sections where I found this ball laying in the 4th row, under a seat. This ball was another Astros commemorative, which I sold to a fan for $20! Ball #4 – was a toss-up from Blake Parker in right field. Another Astros commemorative. Ball #5 – was another Astros commemorative ball (that’s all the Cubs used during BP at this game, which made us ballhawks happy) and it was hit by Cubs backup catcher and Pittsburgh area native, Blake Lalli. 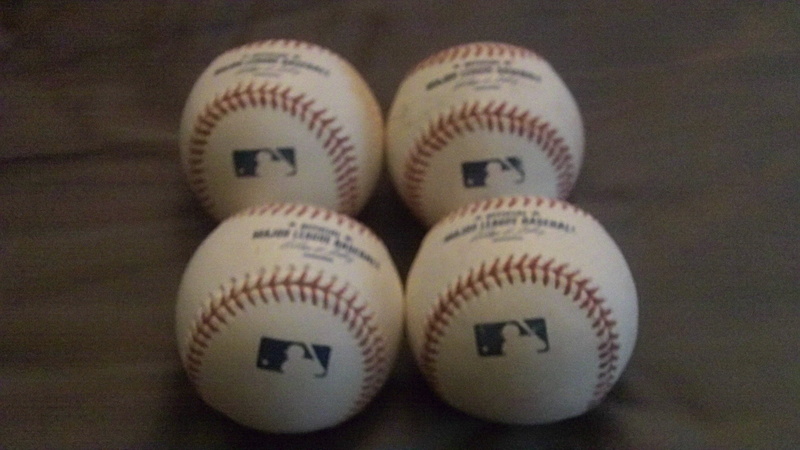 Upclose and cool picture of the 4 baseballs I kept from this game. 5 balls at this game (4 pictured above because 1 was sold). 26 balls at 9 games this season. After getting home from vacation in Florida, it felt good to be back at PNC Park. 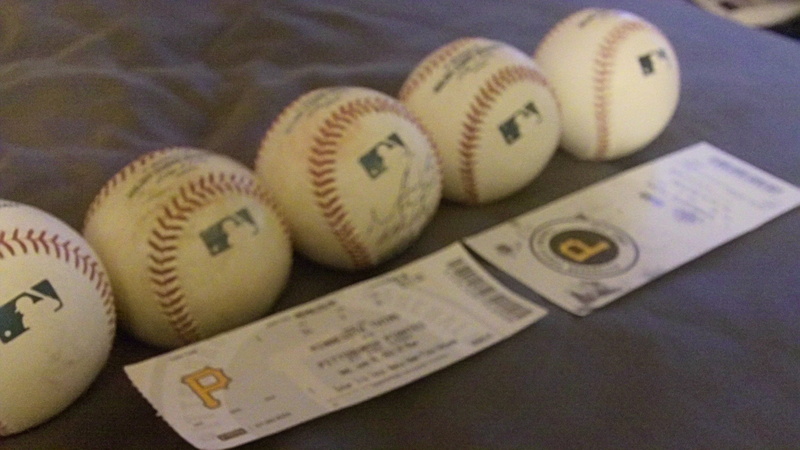 Also, since I only snagged one ball at Tropicana Field in my previous, I was hoping for a big day at PNC. I got on the bored early, I saw outfielder Jose Tabata walking toward the warning track to pick up a ball, I yelled his name, and he tossed the ball my way for my first ball of the day. Near the end of Pirates BP, pitcher Jeff Locke tossed me my second ball of the day. Shortly after that, the Pirates left the field and the Mets made their way out. 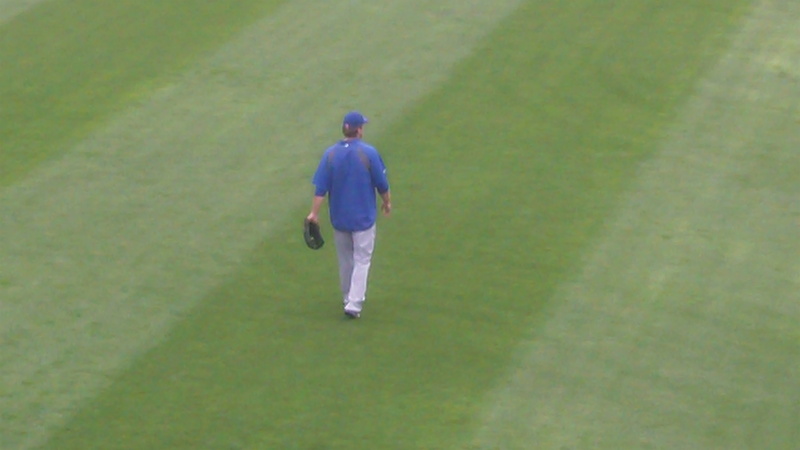 A few minutes into Mets BP, I got the attention of an unknown Mets pitcher (I think it was Jeremy Hefner, but I’m not completely sure). Anyway, he picked up a ball and tossed it my way for my third ball of the day. Anybody know for sure who that is? My fourth ball of the day, was a toss-up from Lucas Duda in right field. At first I wasn’t sure if that was Duda or not, I asked two other ballhawks to find out for sure. My fifth ball of the day was hit by Ike Davis. 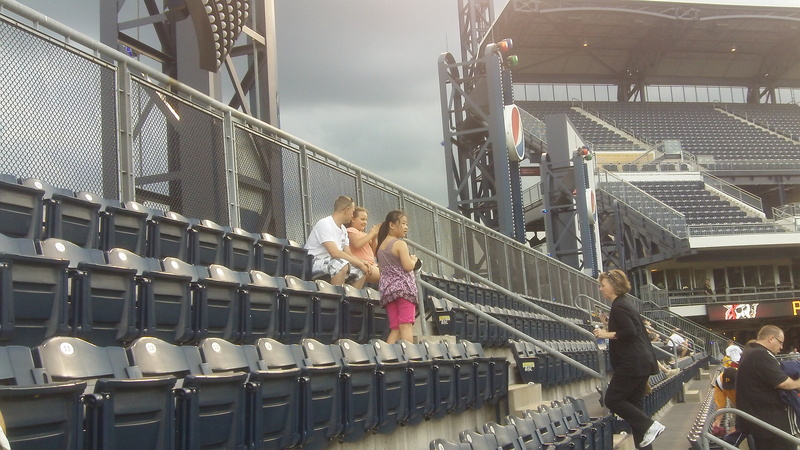 The ball hit the seats and bounced around, and I was picked it up, and then handed to the little girl in orange in the picture below. 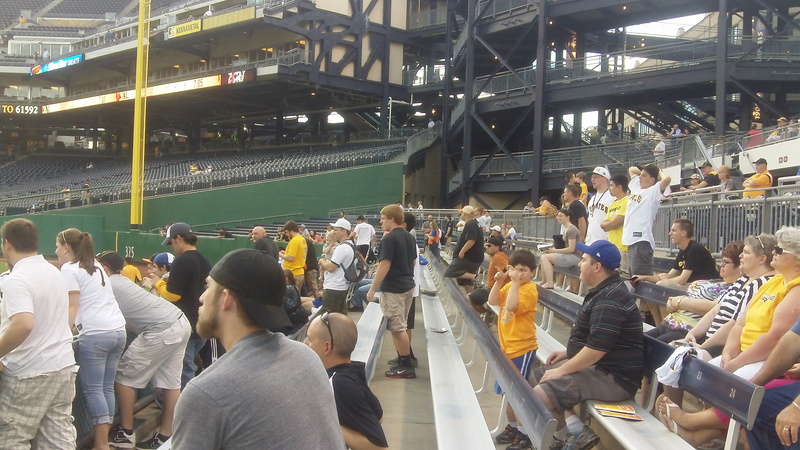 After I snagged that Ike Davis ball, I went back to the bleachers, and they were crowded. I was close to a ball that would have been my sixth of the ball, the ball hit a bleacher and bounced around, and another fan picked it up. 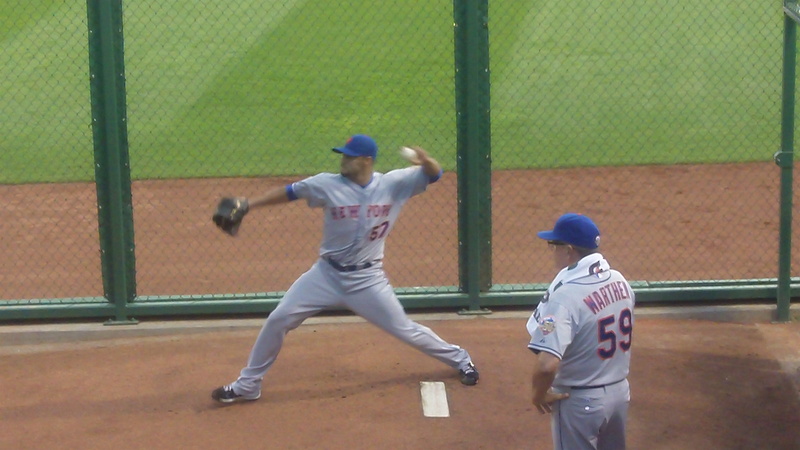 The starting pitcher for the Mets was 2 time Cy Young winner Johan Santana, I have always liked Santana, it’s good to see him back after missing alot of time due to injuries. I stayed for this whole game, the Mets got out to an early 4-0 lead, but the Pirates came back for win, it was an amazing game. 5 balls at this game (1 ball given away). 21 balls at 8 games this season.